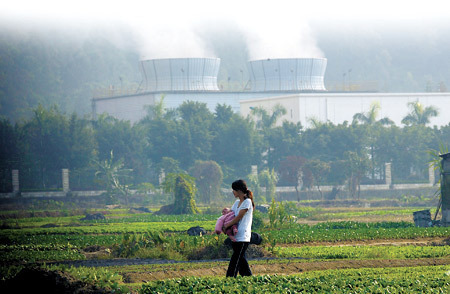 As she looked at the plumes of smoke billowing into the skies from the nearby garbage incinerator, Zhang Xiemei hugged her baby and dreamed of one day taking her away from Likeng. The grocery store owner has been growing more concerned about the health of her 14-month-old daughter since several cases of lung cancer were reported among her neighbors. "The incinerator is too close to my apartment, I'm really worried my baby will get sick," said Zhang, 32, who moved to the village in Baiyun district of Guangzhou, capital of Guangdong province, with her husband seven years ago. "More people are considering leaving here. We can smell the thick stench of burning trash, and it is getting stronger every day." The incinerator opened in 2005 and phase two of the project is expected to start next year, according to the local authorities. "The situation will only get worse," said a 72-year-old resident surnamed Huang. "We already have to get drinking water from outside of the village. The water here can only be used for irrigating the crops. No one feels safe drinking from the local wells any more." Local officials on Sunday told a press conference that no workers at the Likeng project had been reported to have cancer. However, Zhang and Huang are among the thousands of residents across China already living near waste incineration plants. Many authorities also plan to construct even more facilities to cope with the country's growing mountains of garbage. The situation has led to several high-profile protests by citizens demanding a halt to proposed projects, and Chinese experts have warned such standoffs pose a real threat to social stability in the country. To allay fears and put an end to the controversy surrounding waste treatment plants, the Ministry of Environmental Protection has announced it is working to tighten emission standards for waste incineration plants. The new standards for dioxins, highly toxic compounds found in emissions that have been linked to cancer, and other pollutants will be "consistent" with international levels, an official with the ministry's pollution prevention department who asked not to be named said yesterday. He said all incinerators will be ordered to upgrade facilities and follow the new standards, although he failed to elaborate on a timetable or specific plan. But even with the stricter supervision, many specialists in waste management still say that the government is moving in the wrong direction by trying to solve the country's garbage problem by building more incinerators. 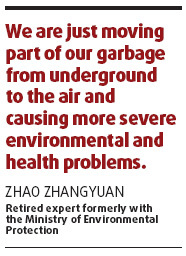 "We are just moving part of our garbage from underground to the air and causing more severe environmental and health problems," said Zhao Zhangyuan, a retired official formerly with the ministry. Landfills and incineration are the two most common methods of waste treatment in China, and both have dangers. Landfill sites, where the refuse is buried, can leak and release toxic gas, while burning rubbish at incinerators releases dioxins, chemicals derived from petroleum that, according to the World Health Organization, can damage the human immune and nervous systems. China's national standard on dioxin emissions is 1 nanogram per cu m - 10 times the allowed amount in the European Union and the United States. By September last year, 100 incinerators were at various stages of development across the country, with 60 already in operation, showed statistics from the Ministry of Environmental Protection. A report on garbage treatment by the Chinese Academy of Sciences this month, however, said that more than 70 percent of the nation's domestic incinerators would not meet EU standards. Zhao said the fact China was building so many of incinerators was a disaster. "Japan is an experienced country in garbage incineration with EU standards, but it is shutting down more than two-thirds of its incinerators due to their negative impact on the environment and humans," said Zhao, adding that US is also shutting down 137 incinerators.